CAN YOU FIND THE CONNECTIONS? Part 2 of the 'Weird-Hand-Lines Quiz' should be really a 'tempting' task for any member (but part 1 is much more easy! 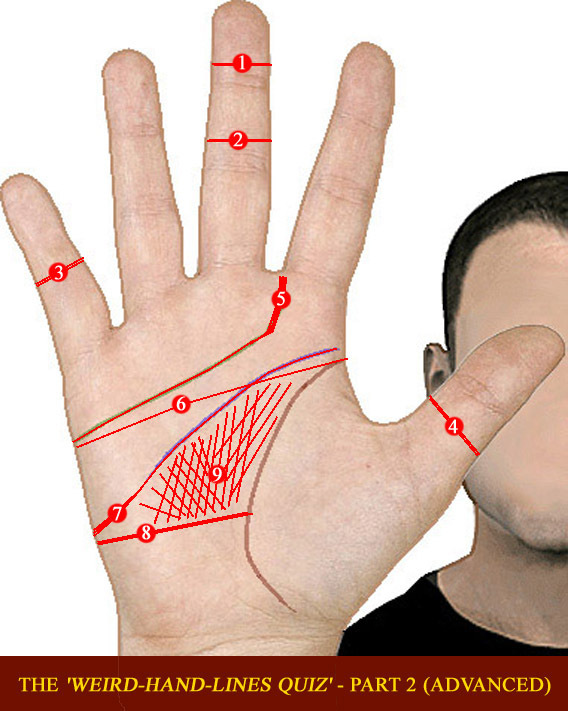 ): people who are familiar with what modern science has learned us about the hand lines should be able to make at least a few connections between the lines & the disorders! ... only by revealing how many of your connections are 'correct'!! Have fun... and good luck!! PS. Most 'professional' + 'expert' members will probably be able to find one or a few connections, but I think it will take quite some efforts (including some 'googling') to solve this quiz!! Is one line able to represent more than one disorder? Or vice versa? Down's syndrome can be listed on line 3 and line 7. So, in part b of the QUIZ the task is much more complicated... to find the right connections. But for sure, it's a 'puzzle' that can be solved! Did some basics, now time to google......(hopefully time on Sunday). This is a challenge! I know a few of them, but some of these syndromes are new to me, and indeed some of the hand features eg extra crease on top phalanx (I don't remember reading about that before). Hahaha ... Lynn, sounds like you're beginning to like 'part b' of the Quiz!??? But maybe, just to avoid that you're jumping from the right- to the wrong conclusion... which hand line did you have in mind with 'sickle cell disease'? PS. I would not advice to use PubMed, instead you better start using 'Google Scholar': http://scholar.google.com/ ... which includes are sorts of related websites! Martijn (admin) wrote: Hahaha ... Lynn, sounds like you're beginning to like 'part b' of the Quiz!??? Yes, but please stop laughing! I was trying hard! Martijn (admin) wrote: But maybe, just to avoid that you're jumping from the right- to the wrong conclusion... which hand line did you have in mind with 'sickle cell disease'? I thought it was extra phalangeal creases on 2nd phalanges (line 2) but apparently it is something I never heard of before. Martijn (admin) wrote: PS. I would not advice to use PubMed, instead you better start using 'Google Scholar': http://scholar.google.com/ ... which includes are sorts of related websites! thanks for the tip! I never heard of 'google scholar'. will try again tomorrow or Sunday. Yes Lynn, you've found a clue... I can confirm that the 'sickle cell disease' is indeed... NOT connected to line 2. ... 8 options left for that disorder... ... oops, sorry again! 8 options left for that disorder... ... oops, sorry again! is anyone else trying this challenging quiz? I am a bit confused with, well most as I don't have a mebership with most of the reference sources- so it's going to take eons of time!! !, but with the Foetal Alcohol- I thought there was an increased rate of Aberrant Sydney and STPC lines? Felicity Martin wrote: I am a bit confused with, well most as I don't have a mebership with most of the reference sources- so it's going to take eons of time!! !, but with the Foetal Alcohol- I thought there was an increased rate of Aberrant Sydney and STPC lines? Yes, I can confirm that some studies have connected the Sydney line with fetal alcohol disorder. But this was not confirmed by all studies. However, I can report that in this quiz 'fetal alcohol syndrome' is NOT connected with line 7 (= Sydney line). Yes, you're right... last night I got infected with giggles ... so I was just 'fooling around'. Glad to hear that you got infected, but I agree... let's get back to this challenging 'QUIZ'! I am sorry for the literals in my reply- must have been tired! I meant the Simian and Sydney(STPC) lines, both slightly increased aberrations with foetal alcohol, but thank you for pointing out that this is not replicated in all studies. With the Coffin Lowry syndrome and number 8 - is this line also what I often have called the via lasciva or poison line? I have found this associated with antibiotic sensitivity and also increased in strength with heavy antibiotic use with resistant infections- but please note these are just a limited number of observations obviously. With the aberrant Sydney line and head line, I have noticed this in people with a history of heroin use, but now wonder whether the line predisposed them to the drug abuse or the drug abuse caused it? Are the lines on the fingers, added lines or are they creases in different positions- the overlapping fingers that are associated with Edward's syndrome? Thanks for adding your correction, though from my side I can add that in this quiz 'fetal alcohol syndrome' is also NOT connected with line 6 (= simian line). PS. Looking forward to your or anyone else's first attempt to actually 'win' the quiz! Crease 1,2 and 4 are extra creases.... (edit: ) so, these are present next to the normal interphalangeal creases. 'Overlapping fingers'...? Sorry, I am not sure what you have in mind... I have an association with the phenomenon called 'syndactyly' (which concerns fingers that are grown together) - but I don't recognize how that relates to the quiz - so you probably have something else in mind??? hi I've seen what you are referring to Felicity re overlapping fingers - when hand is clenched and 2nd & 5th fingers overlap 3rd & 4th. Lynn, I didn't know about the clinched fingers in Edward's syndrome - thanks for menitoning that... though it probably doesn't relate to the typical line that is involved in the majority of the rare cases of that syndrome. (NOTICE: This comment provides 4 clues!!). Reading through all the clues I think I have lines 1,3,5 and 6 figured out. 5 more................although I am fairly sure about line 8. Hope to get back to this in a few hours. So, in this case, with the rarity of the disorder and the only noted significant information for this quiz (without knowing how many out of the 7 had this) is the “palmar and digital flexion creases are normal with an extra flexion crease on the thumb.” (only saw this through the web description, I can not see the article since I do not have a subscription) I do not think I can assign line 4 (or any other line) to this disorder . Other than that I am not finding anything on the extra crease on the thumb. hi tap, yes this quiz is tough! So far I only related 4 of the disorders to 6 hand features. tho I think you found something significant there in Pitt-Rogers-Dank syndrome & "an extra flexion crease on the thumb" ....sounds good for line 4. Thanks, I'm going to cheat and put it down! PS tap, did you post the correct link? seems to be about relative finger length, I couldn't find anything about extra flexion crease on thumb or PRDS?? tap wrote: Reading through all the clues I think I have lines 1,3,5 and 6 figured out. But obviously, by sharing too much info... ... somebody else might take the victory away before you even posted your first attempt!! Who dares... to give this quiz a first whirl? Martijn (admin) wrote: But obviously, by sharing too much info... ... somebody else might take the victory away before you even posted your first attempt!! Oh, surely nobody would be so devious as to cheat by stealing tap's hard-researched info? tch, how unsporting! The introduction to the article does state " unusual palmar creases "
Thanks tap. gosh I glaze over after 20 mins of scientific abstracts not easy is it.